The most famous mobile data application around the world is Short Messaging Service (SMS). Nobody had expected that it will become so popular when it was introduced. In fact when our company talks to clients for mobile based data applications they generally ask for SMS related applications. MIDP 1.0 did not contain any facility for sending or receiving SMS. This was a major drawback. In fact I remember that once a client did not give our company a contract for J2ME applications because MIDP 1.0 did not support SMS. Sensing these problems that a lot of companies were encountering JSR 120 – Wireless Messagin API was launched. It has brought the power of sending and receiving SMS to the java applications. It is a very simple but powerfull API. The only drawback which I have encountered while working with this API is that while you can send SMS to anybody you can not receive SMS in the applications from ordinary mobile phones. This problem is due to the fact that to receive SMS the application has to book a port. Since normal mobiles can not add specific port number in the receiver’s address there is no way receiving the SMS from a normal mobile phone to a phone containing a J2ME based SMS application. The SMS always goes to the phone inbox instead of the application. Also JSR 120 does not support application activation on receiving an SMS for the application. The SMS is received only when the application is active. Inspite of these short comings JSR 120 is excellent from the point of sending SMS. It also contains the facility for sending binary SMS. This is a very usefull feature and can even be used for secure communication by writing a class to encrypt the SMS and then send it. The receiver will decode the SMS and show the message to the user or act according to the application logic. Connector is a factory class for creating new Connection objects. This field stands for the access mode READ. This field stands for the access mode READ_WRITE. This field stands for the access mode WRITE. This method returns a new Connection object. The only parameter of this method contains the URL for the connection. This method returns a new Connection object. The first parameter of this method contains the URL for the connection. The other one contains the access mode. This method returns a new Connection object. The first parameter of this method contains the URL for the connection. The second one contains the access mode. The thirg contains a flag that tells that the caller wants timeout actions. BinaryMessage is an interface that represents a binary message. BinaryMessage contains methods to get and set the binary data payload. This method returns the payload data of this message. If the data has not been set it returns null. This method is used for setting the payload data. The payload data is in form of a byte array. Message is the base interface for interfaces that represent various types of messages. This interface defines the common functionality between various messages. The whole approach of ‘Wireless Messaging API’ is that the message can communicated independent of the network type be it GSM or CDMA. This method returns the address of this message. In case the address is not set it returns null. If you want to include the reply functionality just re-use the message object you have received. Only change the payload data of the message. The address of the message need not be touched. This method returns the date object indicating when this message has been sent. This message sets the address associated with this message. Setting null is a valid value. · Methods for creating new messages. · Method to calculate the number SMS required for sending the message. This field is a constant for message type binary messages. This field is a constant for message type text messages. This method returns a Message object for a given type of message. This method returns a Message object for a given type of message with a particular destination address. This method returns number of protocol segments needed for sending the message. This method will return 0 if the Message object cannot be sent using the underlying protocol. This method helps in receiving a message. This method will block until either the message is received or the MessageConnection is closed. This method helps in sending a message. This method registers a MessageListener object to which the platform can notify that a message has been received on this MessageConnection. This interface provides a mechanism for the application to be notified of incoming messages when they arrive. This method is called by the platform when an incoming message arrives to a MessageConnection for which the application has registered this listener object. TextMessage is an interface that represents a text message. This interface contains methods to get and set the text payload. This method returns the text payload of this message. It returns null if the payload for the message is not set. This method sets the payload text data of this message. The payload data may be null. Now we will be discussing the JSR 205. The recent changes in the technology have led to the need of supporting multipart messages. With the introduction of Multimedia Messaging (MMS) the need was felt for APIs which could help a J2ME application send a multimedia message. With this in mind the JSR 205 was released. Since the JSR 205 is using JSR 120 as its base we will be only discussing the new APIs. The classes and interfaces contained in JSR 120 have not been discussed. The content contained in a MessagePart can be of any type. It is also possible to specify the content location and the encoding scheme in a MessagePart. This constructor constructs a MessagePart object from a subset of the byte array given in the parameter. This constructor is suitable for small messages only. This constructor constructs a MessagePart object from the given byte array. This constructor is useful only if the data size is small i.e. roughly less than 10Kb. 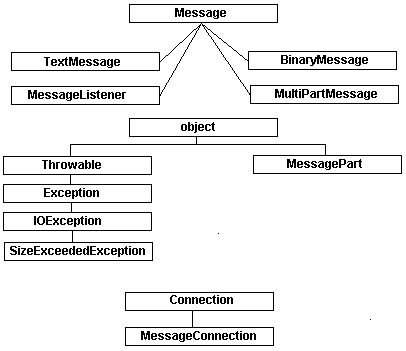 This constructor constructs a MessagePart object from an InputStream. The contents of the MessagePart are loaded from the InputStream during the constructor call. The contents are loaded until the end of stream is reached. This method is useful even for bigger data payloads. This method returns MessagePart data as byte array. This method returns an InputStream that can be used for reading the contents of this MessagePart. This method returns the value of content-id as a String. Otherwise it returns null if the content-id is not set. This scenario can happen if the message was sent from a non JSR 205 compliant device. This method returns content location. This method returns encoding of the MessagePart content otherwise it returns null if the encoding scheme of the MessagePart cannot be determined. This method returns content size of this MessagePart. It returns 0 if the MessagePart is empty. The content size is returned in bytes. This method returns MIME type of the MessagePart. MultipartMessage is an interface representing a multipart message. It contains methods to add and get MessageParts. MultipartMessage also allows specifying the subject of the message. It also offers methods to get and set special header fields of the message. The address types are defined in form of above mentioned strings. The second parameter takes in the address. This method returns true if it was possible to add the address otherwise it returns false. This method attaches a MessagePart to the multipart message. This method returns the “from” or “to” address of this message. It may also return null if the address that is expected as a result of the method is not set. This method returns the addresses as a String array or null if the address of the specified type is not present. This method returns the content of the specified header field as a String or null if the specified header field is not present. This method returns array of MessageParts or null if no MessageParts are available. This method returns the content-id of the start MessagePart or null if the start MessagePart is not set. This method returns the message subject as a String or null if this value is not present. This method returns true if it was possible to delete the address else it returns false. This method removes all addresses of types “to”, “cc”, and “bcc” from the multipart message. This method removes all addresses of the specified type from the multipart message. This method returns true if it was possible to remove the MessagePart otherwise it returns false. This method returns true if it was possible to remove the MessagePart with the given contented otherwise it returns false. This method returns true if it was possible to remove the MessagePart at the specified content location otherwise it will return false. This method sets the “to” address associated with this message. The address parameter may be set to null. This method sets the specific header of the multipart message. The header value that is being set can be null. This method sets the Content-ID of the start MessagePart. This method sets the subject of the multipart message. This subject can be null. This exception inidicates that an operation is not executable due to insufficient system resources. This constructor constructs a new exception.